STOP PRESS – STOP PRESS!! This event is shelved till further notice. The area was affected by the recent fires with many of the steps and timber bridges destroyed. Permanent numbers for the 24 km after 5 Runs ! Follow this link to the January 2013 Race photos. The two routes have been carefully chosen to challenge intermediate and experienced trail runners over a variety of terrain as well as offer an easy route for the first timers and not so fit or technical runners to enjoy the best Knysna has to offer. The area is closed to day visitors and offers the participants a chance to enter areas that would not be otherwise possible. We rely heavily on NSRI Station 12 for our safety plan. Please show your appreciation by being generous with you donation on the entry-form. This route is suitable for the average road runner or Walker wishing to gain trail experience. It contains one optional technical section that can be skipped if the runner so wishes. The easy detour will take some four minutes longer to complete than the technical section. Water points are well placed and not more than 6 km apart. The routes will be clearly marked and main junctions will be marshaled. Most of the route is run under full tree canopy. This trail is for confident trail runners. Extreme caution need to be exercised on the technical sections of this trail. Mistakes will at a minimum be painful and can also be fatal. Rescue operations on the coastal section will be risky for the injured and for the rescuers. Move at a speed that falls within your capabilities and we will all have a great day in Mother nature. The compulsory safety kit that you wil receive in your race pack need to be carried at all times. The water provided on the coastal section will be from the local fresh water springs. Welcome in my back yard! Earphones can be worn but would you really want to? Medical, Rescue, Marshall’s, and organizers decisions is final. Closing date for entries is soon as entry cap have been reached for each race. Start chutes close at 6:45 sharp on Race day for compulsory race briefing. Arrivals after this time will not be allowed to start. Along the coastal section on the 24 km, emergency evacuation will be by way of a floating raft to the NSRI rescue craft. If you have undue fear of water or boats, rather enter the 16 km event. The runner arriving before you at a technical section determines the pace. Do not hassle or crowd a runner while an obstacle is being negotiated. The trail is designed with ample overtaking opportunities before and after obstacles. Do not “race” the technical sections. Remain in the order of arriving at obstacles as some queuing will be needed at certain obstacles. Water points will have water and Juice . All refreshments must be enjoyed at the table and no cups must be removed from the points or be carried onto the route. Water will be available to fill backpacks. Spectators will be restricted to the Start/ Finish area. Your race pack will contain the final race rules and race instructions. 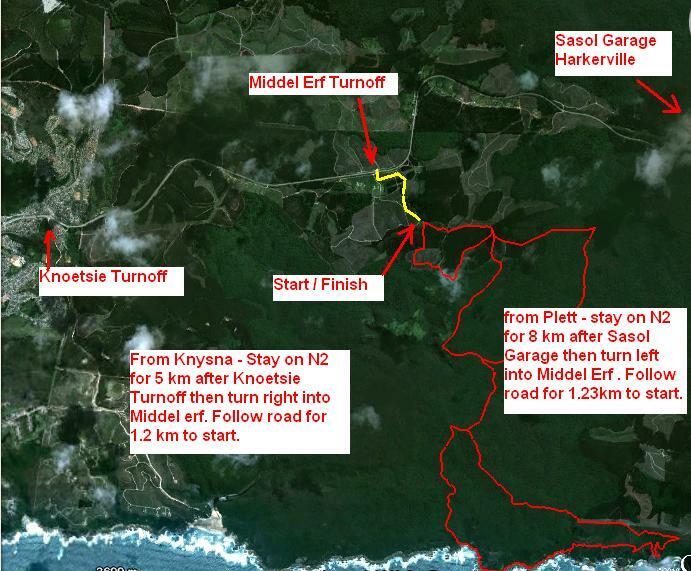 Start and finish venue is 10 km outside Knysna towards Plett Just off the N2. Parking marshals will assist with parking. Due to the high fire risk you are not permitted to park offroad. No entry onto the venue or trails before or after the event. Prize giving is at 12:00 . You must be present to be in contention for Lucky draw prizes. First 3 spots on both races will earn prize money for men and women. What a great run, I really enjoyed the 24km route which was quite challenging. Only problems were the lack of route markings (which meant that I also got lost for a while – part of the fun) and the cyclist who removed the barrier tape. Beautiful scenery that will be difficult to beat anywhere in the world. Thanks to KMC for a great event, I hope to be back! An exceptional experience, and a race I will definitely be back for next year! As I had spent most of the 2 weeks preceding the much-awaited race in bed, I was forced to take it very easy (I had no strength, anyway), and for once experienced what it is like to be a back marker. It is quite lonely back there in a relatively small field; particularly so when it is not always all that obvious that you are on the right track. The odd bit of bunting did help (although I also repaired one after the climb up from the “beach” that a cyclist had thoughtlessly taken down) and I do believe that there is a case to be made for more marshalls to be present at the sometimes confusing intersections, twists & turns. KMC still gets 9 out of 10 for a wonderful trail run. It was the toughest thing that I have ever participated in. wow, sounds great, unfortunately I have to attend to my cellar and wine tasting in Franschhoek, You are so spoiled with some of the most beautiful trail running routes. Enjoy.